The Calgary Flames wanted to get Elias Lindholm under a long-term contract as soon as they acquired him from the Carolina Hurricanes, and today they’ve accomplished their goal. The team has signed Lindholm to a six-year deal worth $29.1MM ($4.85MM AAV). The deal will not include any trade or movement protection. Lindholm was scheduled for an arbitration hearing on August 1st, but will obviously no longer need to negotiate for a settlement. Immediately after the Flames acquired Lindholm, speculation exploded about a potential fit for him next to star forwards Johnny Gaudreau and Sean Monahan. Micheal Ferland, who was part of the package sent to Carolina in exchange for Lindholm and defenseman Noah Hanifin, had found success playing on the team’s first line but doesn’t possess the same level of skill as the former Hurricanes forward. This long-term deal only strengthens the idea that Lindholm will be inserted as a key part of the offensive group, and relied upon as a big contributor for the next several seasons. He immediately becomes the team’s fifth highest-paid forward, only behind Gaudreau, Monahan, Mikael Backlund and the recently signed James Neal. Only 23, the Flames are expecting big things from Lindholm. Selected fifth overall in 2013, he jumped almost immediately to the NHL and has already played 374 games in his young career. With four consecutive seasons of at least 39 points, it’s not hard to expect him to fit in nicely alongside the forwards already in Calgary and develop into the kind of dominant two-way player many believe he can be. Lindholm has plenty of experience at center and could also be used in that role at times given his handedness—Monahan and Backlund are both left-handed centers, while Lindholm and newly signed Derek Ryan give the team a pair of right-handed options in the circle. Though he does seem to be a perfect fit for the Calgary offense, it’s not like they’re signing a risk-free deal. After playing five seasons already, Lindholm was on track to hit free agency as a 25-year old, meaning that four of the years covered by the new deal are based on what he could earn as a unrestricted free agent. Unfortunately that has pushed the average annual value up to a point where should Lindholm struggle to improve on his career numbers he actually could be fairly overpaid. 40-point centers are extremely valuable in the NHL, but wingers with the same level of production are much less so. If Lindholm is moved out of the middle and can’t improve, the Flames may find themselves with a relatively overpriced asset. That’s obviously a risk they’re willing to take though, and one that seems prudent given their competitive window. The Flames want to compete for the Stanley Cup right now and for the next several years, using the prime years of Gaudreau and Monahan to their full effectiveness. Both players are signed to team-friendly contracts at the moment, but will be looking for huge raises in a few seasons. The team also has an aging group on defense with Mark Giordano (34) the only one under contract for more than two seasons. Hanifin represents a big part the future on the Calgary blue line, but there’s no guarantee the other young prospects can handle the same load as players like Giordano Travis Hamonic and Troy Bodie do right now. The Flames are going for it, and need to bounce back from an extremely disappointing 2017-18. For Lindholm, this is an excellent contract and one that will allow him to still hit the open market before his 30th birthday if he so chooses. 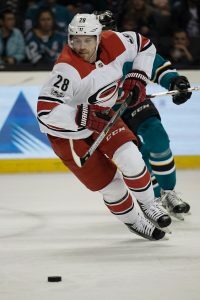 He’ll be reunited with head coach Bill Peters who has also moved from Carolina to Calgary, and could get a chance with some of the most talented players he’s ever played with. It’s been an exciting summer for him already, but now he’ll have to prove he’s worth nearly $5MM per season going forward. Elliotte Friedman of Sportsnet broke the news on Twitter, including both length and AAV. The solidity of this trade for both the Hurricanes and the Flames will be confirmed by play on the ice. Too many variables to predict the outcome. We will see.